Latex allergy is a hypersensitivity response to the proteins in natural rubber latex obtained from the sap of the rubber tree, Hevea brasiliensis. The sap is combined with chemicals through manufacturing to yield latex its elastic property. Natural rubber latex is often found in rubber gloves, condoms, balloons, rubber bands, erasers, and toys. People who wear latex gloves as part of their jobs, such as health care workers, are at highest risk for latex allergy. Other occupations like food service workers, housekeepers, hairdressers, latex rubber products manufacturers, and people who have food allergies and sensitivities, and those who undergo repeated surgeries are at risk, too. Studies reveal a high incidence of latex allergy in patients with spina bifida who had multiple surgeries in childhood. Natural latex rubber allergies are IgE-mediated reactions to at least 10 different low-molecular-weight, water-soluble proteins contained in rubber tree sap. Allergic reactions to latex range from mild to very severe. Every year, there are hundreds of cases of anaphylaxis, a life-threatening allergic reaction, due to latex allergy. The severity of allergic reactions to latex can exacerbate with repeated exposure to the substance. Fortunately, most hospital equipment and facilities are latex free, though, some commodities are not. Some products that may contain latex are certain types of sterile gloves, stethoscopes, bandages, adhesive tapes, electrode pads etc. Nurses taking care of patients with a latex allergy must take appropriate care to make certain the patient is not exposed to latex. Patient discusses the effects of wearing a Medic-Alert bracelet and wears one. Patient distinguishes appearance of latex allergy. Patient experiences a latex-free environment for all health care procedures. Patient records history of risk factors. Patient recognizes type of reaction. Patient withdraws from areas where there is powder from latex gloves. 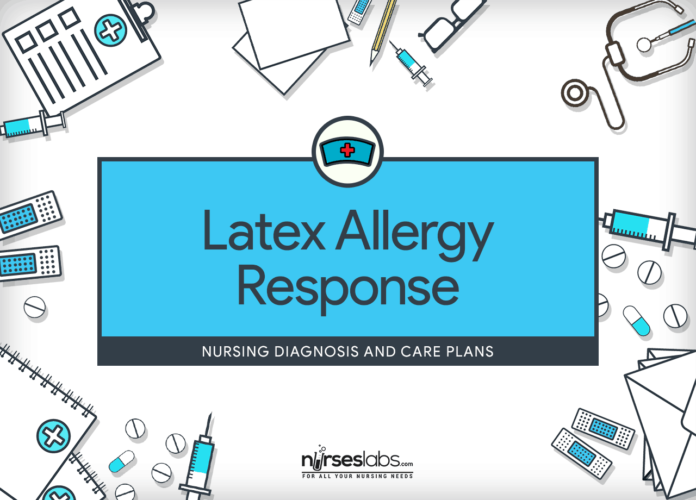 Thorough assessment is vital to determine potential problems that may have lead to Latex Allergy Response as well as handle any incident that may appear during nursing care. Note any allergies to food like avocados, bananas, chestnuts, mangoes, kiwi, and tomatoes. These foods have proteins comparable to those in latex rubber. People with these specific food allergies may have a cross-sensitivity to latex. These foods are linked with anaphylactic reactions in people with latex sensitivity. Determine allergic reactions to figs, apples, melon, papayas, celery, potatoes, peaches, and cherries. People who have sensitivity to these foods are known to be at high risk for developing latex allergy. Ascertain for a history of myelomeningocele or urogenital abnormalities in childhood. Multiple surgeries to improve congenital neural tube defects or urinary tract abnormalities in childhood are linked with an increased risk for latex allergy. Observe for allergic reactions after contact with products containing latex such as blowing up a balloon, using a condom or diaphragm, undergoing a vaginal or rectal examination, wearing latex gloves, or doing other work-related activities that involve exposure to latex. Latex allergy may not be familiar or known to many people. Symptoms may be manifested after blowing up a balloon, medical or dental procedures in which latex products were used, or in the work environment. The person may not have associated the symptoms with exposure to latex. The symptoms may have included skin rash, itching, swelling, hives, shortness of breath, runny nose, or cough. Suggest an immunological testing for latex sensitivity. Certain diagnostic tests are prepared to detect IgE immunoglobulins specific to latex and related compounds. Skin prick testing also may be used to identify latex allergy. Put an allergy band on the patient. Every health care provider must be informed about the patient’s latex allergy. Note the latex allergy in the patient’s medical record and post a sign over the patient’s bed about the latex allergy. Noticeable signs are necessary for information and to increase the awareness of all providers and reduce possible exposure to latex. Be vigilant postoperatively and arrange follow-up care. All individuals identified as latex-allergic by history or testing should be counseled by a knowledgeable physician. Eliminate all latex products from the patient’s immediate surroundings. Every latex products need to be eliminated from the patient’s environment to reduce exposure. These products include blood pressure cuffs, gloves, adhesive tape, tourniquets, injection ports, electrode pads, stethoscope tubing, rubber syringe stoppers, and medication vial stoppers. Settle latex-free equipment in the patient’s room. Most hospital equipment and facilities are latex free, though, some commodities are not. It may be necessary to have an emergency crash cart available with latex-free equipment. Ready powder-free, nonlatex gloves for every care activities needing glove use. Cornstarch powder is added to latex gloves during manufacturing. The powder lessens the stickiness of the latex to enhance the ease of putting on and removing the gloves. Research shows that latex protein adheres to the powder. When the gloves are removed, the powder with the attached latex protein in aerosolized. Inhalation of the particles in the air accounts for the respiratory symptoms experienced by the patient with latex allergy. For instance latex products must be used (tubing, blood pressure cuffs, tourniquets), wrap the patient’s extremity with cotton gauze before applying the equipment. This measure will reduce direct contact between the patient’s skin and the latex protein. Administer medications as prescribed. Antihistamines, corticosteroids, and H2-histamine blockers are used as premedications if the patient is undergoing procedures in which latex exposure may occur. Steroids and antihistamines can be used topically or orally to control local allergic reactions such as contact dermatitis. Initiate appropriate emergency care if the patient shows signs of an acute systemic reaction. Measures to maintain airway patency, breathing effectiveness, and circulation are priorities. Drug therapy may include epinephrine and steroids to reverse the allergic reaction. Evaluate the home environment for presence of natural latex products (e.g., balloons, condoms, gloves, and products of related allergies, such as bananas, avocados, and poinsettia plants). Identification and/or removal of allergy stimulants decreases allergic response risk. At onset of care, note patient history and current status of latex allergy response. Seek medical care as necessary. Immediate identification of allergic response promotes prompt treatment and decreases risk of severe response. Do not use latex products in caregiving. Preventing exposure to latex is the key to managing and preventing this allergy. Help patient in identifying and obtaining alternatives to latex products. Preventing exposure to latex is the key to managing and preventing this allergy. Implementing a safe environment for patients with latex allergy is the responsibility of all health care professionals. Educate the patient and family members about the signs and symptoms of latex allergy reaction: skin rash; hives; flushing; itching; nasal, eye, or sinus symptoms; asthma; and shock. Knowledge about this condition is vital for prompt treatment, especially to prevent progression of the reaction to anaphylaxis. Present written information about latex allergy and sensitivity. Education of the public is necessary and has been provided by the development of a latex allergy pamphlet, which contains an explanation of symptoms and risk factors for latex allergy. Teach patient to avoid areas where powdered latex gloves are used, as well as where latex balloons are inflated or deflated. Exposure can lead to an anaphylactic reaction. Tell patients to inform health care professionals if they have a latex allergy, especially if they are scheduled for surgery. To prevent problems connected with exposure to products containing latex, it is important that patients with latex allergy are identified. Instruct patients with latex allergy to wear a Medic-Alert bracelet that identifies them as such. Identification of patients with latex allergy is significant for preventing problems and for early intervention with appropriate treatment if an exposure occurs. Familiarize patients what products contain natural rubber latex and to avoid direct contact with all latex products and foods that trigger allergic reactions. Once latex allergy has acquired, the patient is at risk for anaphylaxis and needs to be informed as to what products contain latex. Encourage the patient to notify his or her employer about the latex allergy and ways to reduce exposure in the workplace. Modifications in the workplace are needed to reduce exposure to latex. Instruct patient to carry an autoinjectable epinephrine syringe if at risk for anaphylactic episode. An autoinjectable epinephrine syringe should be prescribed to sensitized patients who are at risk for an anaphylactic episode with accidental latex exposure.